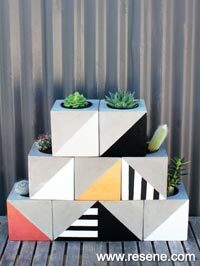 Rose Hughes creates a striking home for your favourite cacti and succulents. Cool cacti and symmetric succulents are good choices for small pots and as easy-care indoor plants. They need little water and their chunky structural shapes are striking. Look out for plants at your garden centre or on the trading tables at garden club shows – but for the best selection of weird plants, visit your local Cactus and Succulent Society show. Auckland’s show is on November 4-6 and Lower Hutt’s on November 20. Simply Succulents and Coromandel Cacti also have a great range of plants you can buy online. 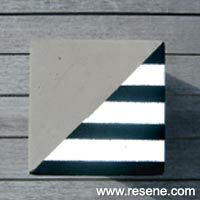 Your will need: 9 pots – mine were sourced from EziBuy and are made of an artificial polymer cement , Resene Smooth Surface Sealer, Quick Dry Primer or Concrete Primer, masking test pots – I used Resene ‘Black’, ‘White’, ‘Copper Fire’, ‘Bullion’ and ‘Silver Aluminium’ and the relevant undercoats for each of the metallics, Resene Concrete Clear (available in flat, satin or gloss) , 6 suitably sized plastic pots for planting into , the plants of your choice. Cost: Approximately $135 (cost of the EziBuy pots) plus plants, paint, tools and pots. The correct undercoat will depend on the composition of your pots. 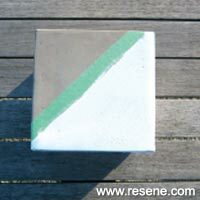 For cement-based pots the undercoat should be Resene Concrete Primer. For composite similar to mine Smooth Surface sealer or Quick Dry Primer will work well. Mask the painted areas in your chosen design. Undercoat using a small roller or brush, allow to dry. Top coat with your chosen colours. 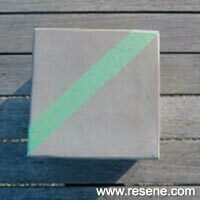 I used masking tape to create the striped effect. Allow to dry, carefully remove the masking tape. 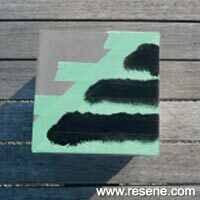 Coat with Resene Concrete Clear to provide a more durable finish.